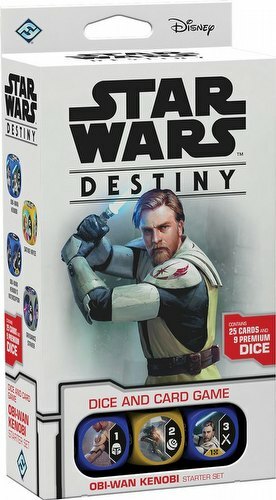 Enter the Star Wars galaxy with the Star Wars Destiny: Convergence Obi-Wan Kenobi starter. The Obi-Wan Kenobi Starter Set lets players use General Obi-Wan Kenobi and Duchess Satine Kryze to fight the Separatist Army during the Clone Wars. It includes 24 cards and 9 dice. Convergence introduces a variety of new mechanics into Star Wars: Destiny, including the ability to hinder your opponent's characters with potent downgrades. Place a bounty on your enemies, lock onto them with a fleet of vehicles, or attack them mentally with potent Force abilities!